I've been obsessing over lovely celestial sun and moon print clothing for a while now, and I've managed to find so many lovely bits in the high street and online that I would like to purchase! I really want to get a sun and moon tattoo at some point, but I still haven't decided whether I want them together or separately on my body. I've got a while to think about it though, as I have no money for tattoos until I've finished my degree unfortunately! My jaw actaully dropped when I saw all the sun and moon print clothing at Motel and I knew that I had to have at least one of them in my wardrobe. I'm also loving all the stone and boho style rings out at the moment and I know I'm going to start building up a big collection of those! I've been looking for some nice patches to start my collection and to sew onto my denim jacket and gilet, and this one is perfect! My boyfriend got some lovely ones from the London Tattoo Convention which I am definitely going to go to next year! I saw that Lucy from Empty Casket posted a picture of this ring last week as a preview and I knew that I had to have it. When it was put online and I saw that it was only £6, I knew even more that I had to have it! As you all know I interned for Waiste Clothing over the Summer, and it was super duper fun. I was there through the whole transformation and relaunch, and that included making lots of fun jewellery. I love this necklace in particular because the little crescent moons are so cute, but all of the new stock is amazing so make sure you go check it out! 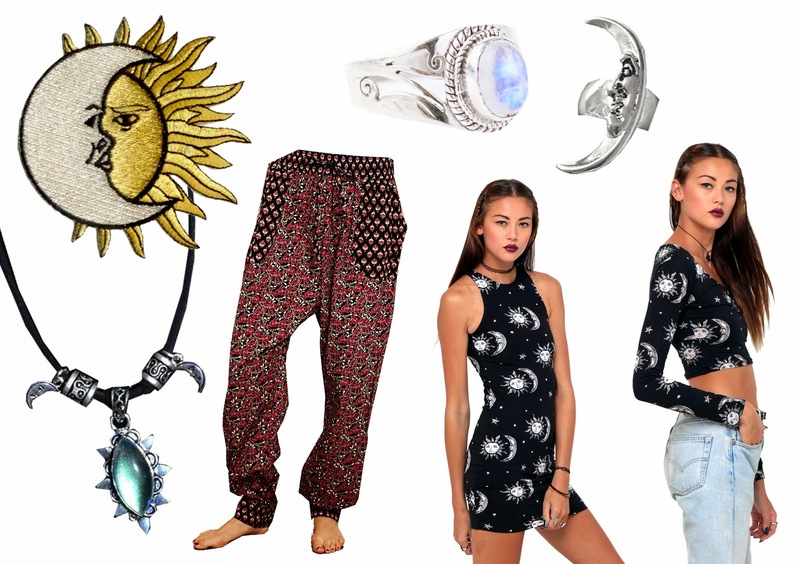 I recently ordered the moon and sun print skirt and crop top today and I'm so in love with them! There are a million things on MotelRocks.com right now that I want to purchase at some point (thank goodness for the discount code!) but this pattern is definitely my favourite thing I've seen in ages! This dress is currently out of stock, but the second it comes back, it's mine! I love the thought of wearing this long sleeved top underneath a black strappy dress or with a fur gilet. It's literally like the perfect Autumn top and the print is gorgeous too! Have you seen any more moon and sun things I would like?